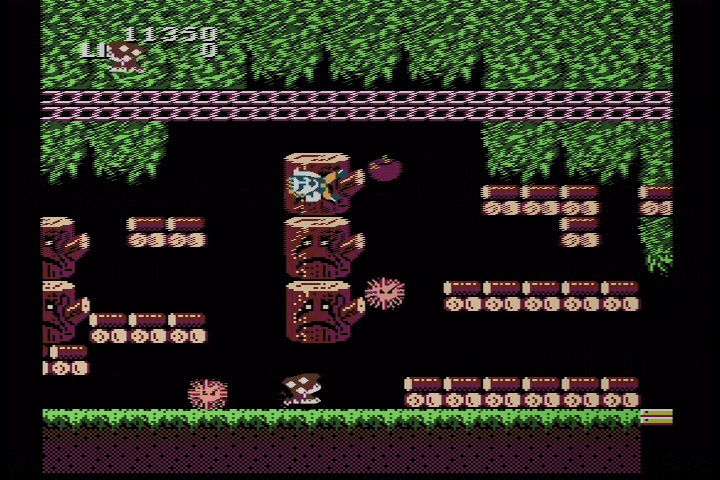 One of the earliest examples of a licensed game based around a Japanese band or musician is Seikima II: Akuma no Gyakushuu. Now this isn’t part two of a game called “Seikima”, the band itself is called “Seikima II”. The intended pronunciation is “seikimatsu”, which means “end of the century”. The kanji used in the band’s name as the ones in that word, but rather those for “holy”, “starve”, and “demon”. This is all short for the phrase 聖なる物に飢えている悪魔がII(ふたた)び蘇る (seinaru mono ni ueteiru akuma ga futatabi yomigaeru), or “Demons starving for that which is holy are resurrected once again”. Much like KISS in the west, heavy metal band Seikima II perform in extravagant makeup and costumes. They all have character names, and frequently (at least in the early days) have songs that feature vaguely horror themed lyrics and performances to accompany their back story. According to said back story, Seikima II are a religious cult of demons whose purpose is to spread Satan’s teachings through music (which they do via Black Masses, otherwise known as concerts). They stated during their debut in 1982 that they’ll break up once they achieved their goal of world conquest at the end of the century. Though they’ve gotten back together several times over the years for reunions, on 12/31/1999 at 23:59:59 they declared that they had in fact conquered the world and were now broken up (though they’d actually stopped activities in July of that same year). At least Demon being in heaven fighting angels (?) makes some sort of sense thematically! In December 1986, Seikima II had just released their third album: Jigoku yori Ai wo Komete (From Hell With Love). This was probably the height of their popularity, having had their first big hit with the single from their previous album (The End Of The Century) called Rouningyou no Yakata (House of Wax), which is still arguably the song that they’re best known for. Many of their albums maintained prog metal/hard rock sound, though sometimes they would dip into more traditional rock ballads and just generally experiment more with different types of sounds. All of this was always followed up by an eventual return to their heavy metal roots though. Over time they’ve become regarded as a legendary heavy metal band that have inspired countless heavy metal acts. It can’t be under stated how important they were to the Japanese heavy metal scene: They were one of the first bands, period. X Japan was starting to become active right around this same time, but they didn’t catch attention and debut until a couple of years after Seikima II. It’s also worth mentioning that as far as I can tell, it was always fairly well understood that they weren’t actually “satanic”, and that this was all just an elaborate act. They’d often later on even present it in very non-serious and tongue in cheek ways, not being afraid to appear on talk segments of music programs and just joke around. Demon Kogure even appeared on the Larry King show in 1992 and joked about his appearance in English. They’ve had a rotating lineup of members over the years, with vocalist and band leader Demon Kogure being the only constant. The lineup at the time this (and the members featured in the game) were Demon Kogure (Vocals), Jail Ohashi (Guitar), Raiden Yuzawa (Drums), Ace Shimizu (Guitar), and Xenon Ishikawa (Bass). Since Dragon Quest had only been released in Japan earlier this same year, Seikima II were not put into an RPG (they might have, had this title started development later), but rather a platformer. 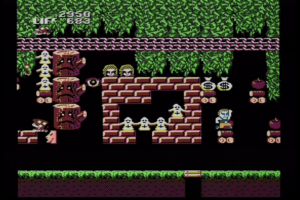 In pursuit of their goal of conquering the world, Seikima II has gone into the Famicom World. But here they were hindered by their arch enemy Zeus, and Demon Kogure’s four band mates were captured. He now jumps and shoots his way through Zeus’ minions throughout four stages in order to rescue them and defeat Zeus. Only then will they be able to conduct their Black Mass (concert) at their demonic temple. 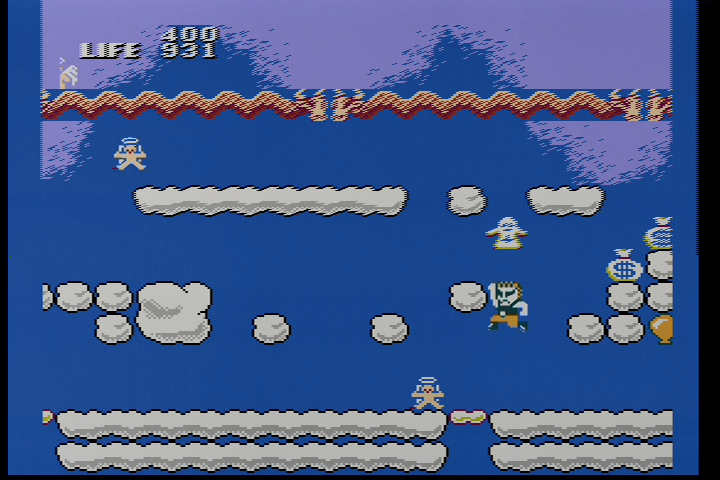 If this were a standard platformer for the time, Akuma no Gyakushuu would probably fall squarely in “playable” territory. But there were two extremely bad decisions that end up making this not even remotely worth playing, whether you’re someone looking to dive deep into the catalog of Japan-only Famicom releases or just a curious Seikima II fan. Much like Dragon Ball: Shen Long no Nazo/Dragon Power, Demon Kogure’s life meter is constantly ticking down and lifeblood (a potion) has to be located in order to replenish it. It couldn’t have taken the idea directly from Shen Long no Nazo, given that it was released only one month before this game. That still doesn’t make it any better of an idea though. You can’t actually die from contact with enemies (because demons don’t die), though they do stun you. 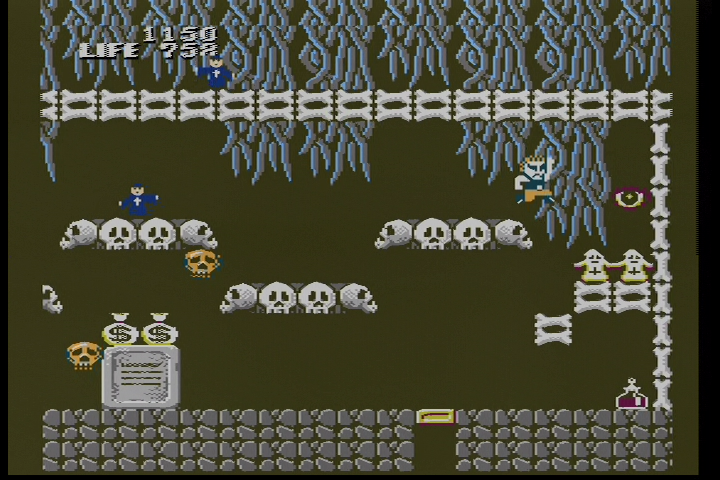 When your life runs out though, I guess you just sort of ascend out of Famicom World and…don’t actually die? Zone 3 seems to be a haunted mansion? Seems more like a place where Seikima II would live rather than someone Zeus would have stashed one of the band members! 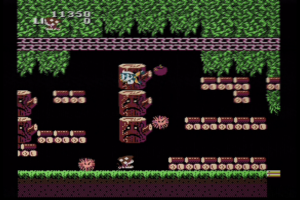 Even worse is that the programmers had probably never played an actual good platformer in their lives. The jumping is just awful: You can’t actually hold the jump button and an upper diagonal direction to jump up to a ledge. You have to jump straight up, and then determine the direction of your jump in mid-air. Otherwise you’ll end up doing a quick but short hop forward. 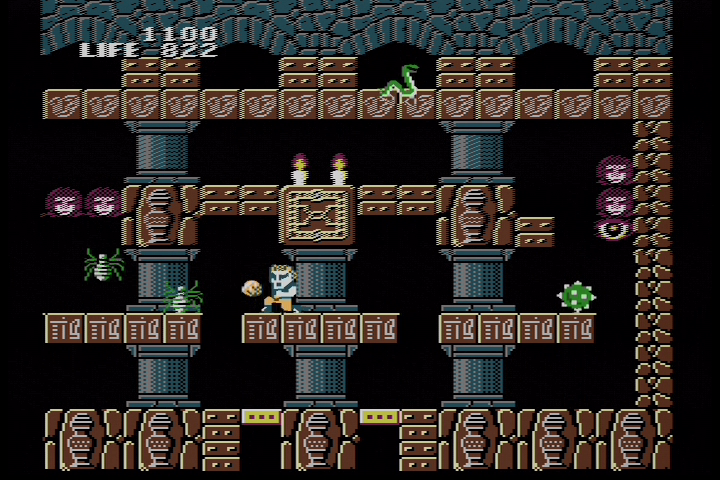 For anyone who has even played an average Famicom era platformer, this scheme is very hard to get used to. The enemies seem to just spawn infinitely as well, so the only purposes to getting rid of them are for score and ease of progression. 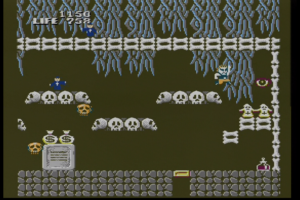 Though since their spawning is random, you sometimes spend precious seconds just clearing out enemies continuously in order to make a single jump. 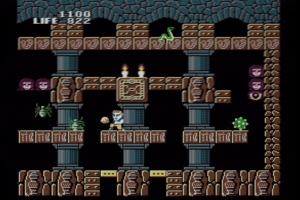 Each stage has a handful of different sub-areas, and all of the items from each of those areas need to be collected before others open up. When you eventually open up the all of the areas, you’ll find a caged member of Seikima II being guarded by a gatekeeper. The key to unlock the cage needs to be located, and the gatekeeper needs to be be defeated in order to free your band mate. 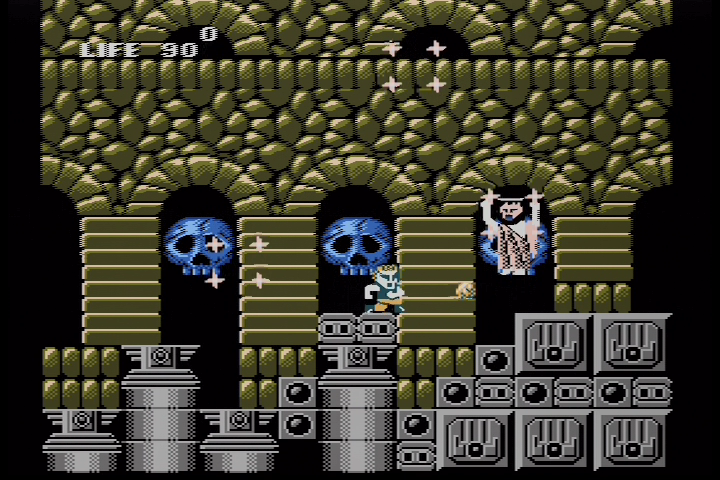 There are also portals located throughout each level where you can buy power-ups for your weapon (the progression is jack knives, axes, fire bombs, bats), and most importantly musical instruments. If you don’t buy all of these musical instruments then you won’t get the good ending, though the game does nothing to tell you that whatsoever. There are codes for continues and a stage select, but using either will not carry over any of the musical instruments you may have bought. So if you want to get the good ending, you have to make it through the game from the beginning, and without continuing! Weapon upgrades aren’t taken into account either, so even if you just want to skip to the last stage and don’t care about the good ending, you’ll have a completely ineffective weapon that takes forever to kill even the standard enemies. Even apart from its bad mechanics and design decisions, the premise of Akuma no Gyakushuu is just boring. And while the 8-bit sprites of the band are very cute, the game doesn’t even hold much of anything for fans given that no 8-bit versions of Seikima II songs are used as the music! It’s just boring original compositions that have horribly short loops. The critical reception of it in Japanese game magazines at the time was maybe even a bit too kind: Famitsu gave it a 21/40, and Family Computer Magazine a 14.07/30. The final battle with Zeus! If for some reason you want to play this game, the only way you can get it (apart from emulation) is by picking up the original cartridge. Being an old licensed game means that it never had a chance of being released to any e-shop or Virtual Console service. 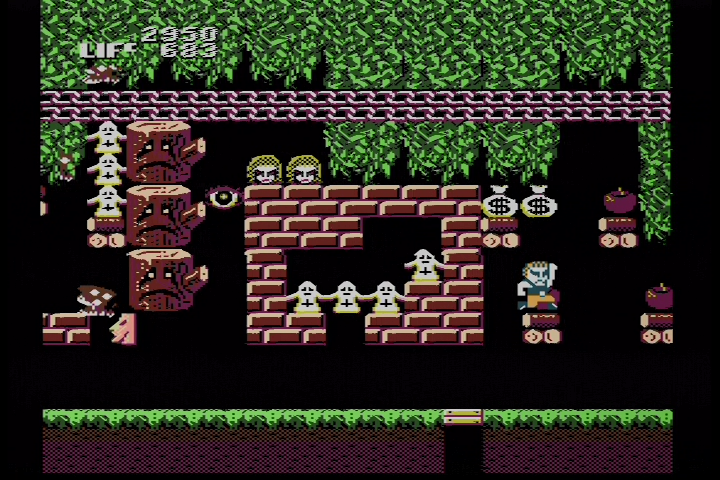 There was a version of it released on the MSX 2 the following year though: Seikima II Special: Akuma no Gyakushuu. 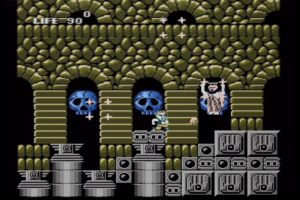 It featured largely redone graphics, and actual Seikima II songs used as the basis for the music (El-DO-RA-DO, Rouningyou no Yakata, Makai Bukyoku, Akumu no Sakebi, Aphrodete, Death Land, and From Hell With Love). The game didn’t use the MSX’s FPM-PAC for FM synthesis though, just the built in PSG. Despite being superior version, it barely sold anything on the MSX. Most of the copies became dead stock, and were harvested for further development on the platform. So this cartridge is actually somewhat rare and pricey these days (at least in comparison to the very cheap Famicom cartridge).